I've got a decision to make about the weekend after next. Do I travel to Louisville, Kentucky, for the National Jug Band Jubilee? 1) The Old Southern Jug Blowers. This is the amazingly authentic jug band from Japan that many of you have seen on YouTube or in the Chasin' Gus' Ghost documentary. They're coming all the way to Louisville for their U.S. debut. 2) Earl McDonald's new gravestone. After locating the grave site of the first commercially recorded jug player, and kicking off a fundraising effort for his gravestone at last year's Jubilee, we are now ready to dedicate the gravestone with a ceremony at Louisville Cemetery on Friday, 9/18. 3) New bands. I believe this is the first year the Jubilee has booked a West Coast band, Devine's Jug Band from San Francisco, and an Upper Midwest band, the Deep Fried Pickle Project from Coloma, MI. It's the only jug band event I know of with a national scope. 4) Big jams. Last year's event was followed by a raucous, late-night jam, but it came together at the last moment and some attendees missed out. This year it will be more official, with a large room booked at the event hotel just for us. Learn new songs and make new friends! 5) Reasonable weather. On last year's mid-August date, I drank twelve bottles of water and was still dehydrated. I'm told Louisville is much more pleasant in September. Or do I stay here in Chicago and go to three different events? Come join the Henhouse Prowlers as they celebrate the release of their latest album: A Dark Rumor. This special concert will be held at Bill’s Blues in Evanston, Illinois on Friday September 18th at 9:00 PM. A Dark Rumor is a collection of new and road tested material from Chicago’s favorite bluegrass pickers. The twelve song album, which will be available for the first time at the show, features 10 original compositions. Guitarist Ben Benedict contributes three songs and additionally sings crowd favorite “10 Miles More” written by the talented Naomi Ashley. Ad hoc Prowler and longtime band collaborator James Weigel assists in the singing and lends his pen to the lyrics five tunes. Rounding out the album are takes on The Stonemans “Turn me Loose” and the ballad “Angeline Malone” by the California ensemble Strungover. Closing out the album is fiddler Ryan Hinshaw’s instrumental “Hadley’s Lament” In addition to the touring band members other instrumentalists include James Weigel on Dobro and bluegrass legend Don Sternberg on mandolin. 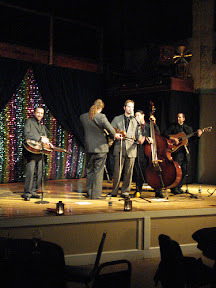 CMC's Made in America Concert Series kicks off with this highly charged acoustic ensemble featuring Keith Baumann. 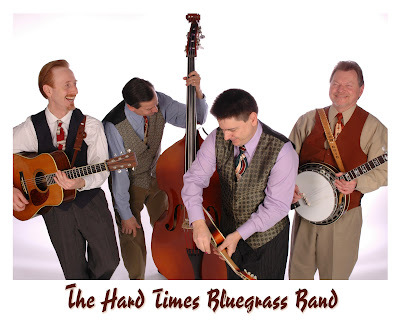 The Hard Times Bluegrass Band delivers the best in bluegrass music, with mandolin, guitar, banjo, dobro, stellar picking and powerful vocals. Special guest and Grammy-winning performer Kathy Mattea is joined by six of today's most polished and compelling folk and roots musicians for a lively, four-hour celebration of songs with substance. Artists include the Austin Lounge Lizards, Haines & Leighton, John McCutcheon, Claudia Schmidt, Michael Smith and Randall Williams - all sharing masterful songs that are touching and topical, sublime and satirical. Jug Band Jubilee, with no regrets. It was wonderful. 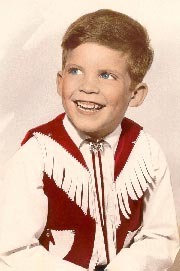 See my blog entry about the Jubilee.